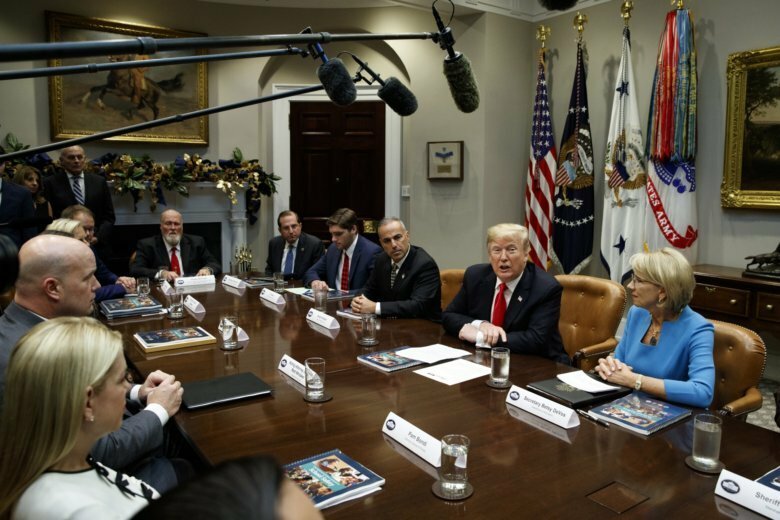 President Donald Trump says one of the nearly 100 recommendations from his administration’s School Safety Commission is an effort to prevent school shooters from capturing the media spotlight. He also says it’s critical for highly trained school personnel to have access to firearms because the average duration of an active shooting is less than five minutes. Trump told reporters at the White House Tuesday that the commission’s report also recommends fixing mental health laws so families and law enforcement can get immediate treatment to those who need it. President Donald Trump’s school safety commission is proposing a rollback of an Obama-era policy that was meant to curb racial disparities in school discipline but that critics say left schools afraid to take action against potentially dangerous students. The panel, led by Education Secretary Betsy DeVos, made the recommendation in a report that lays out dozens of suggestions to improve safety in America’s schools. Trump created the commission in March following the Parkland, Florida, school shooting that killed 17 students and staff members.